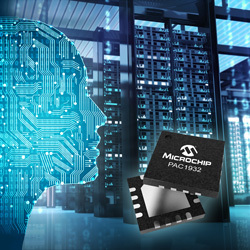 Microchip Technology has released new two and three-channel power monitoring devices that measure from 0V to 32V on a single chip, providing designers with options that are simple to adopt and better power measurement accuracy. The two-channel device is also claimed to be the industry’s first with native 16-bit resolution, providing leading flexibility across a broad measurement range. The PAC1932/33 devices incorporate precisely what is required to measure power on a single IC, combining multiple channels in a single package for applications such as POS systems, ATMs and building automation. This lessens costs for system designers while also strengthening their BOM, as the measurement of sub-1V to 20V voltage rails usually need separate components to measure each rail efficiently. The devices’ capability to measure voltage rails under 1V to as high as 32V also assists developers from having to reconfigure measurement resolution within low and high current load events. The PAC1932 can measure without host intervention for 17 minutes, helping developers from adjusting voltage or current range to measure power and energy. The devices include two 16-bit ADCs that can measure voltage and current together, allowing developers to extract a true power measurement. As a result, developers can design systems better to save power efficiently. As applications continue to explore ways to lessen power consumption, precision DC power measurement has evolved as a key element for energy savings. Just as the four-channel PAC1934 improved power measurement for Windows 10 devices, the new two and three-channel power monitoring ICs allow improved power measurement for low voltage, high power applications in markets including embedded computing and networking.